India is perhaps among the few developing countries where urban agriculture is not a priority. The FAO’s final report on urban and peri-urban agriculture does not even mention India. Urban planners tend to exclude agriculture from their sights. But in many cities across the world, especially those in Asia and Latin America, agricultural use of land is accepted and formalised. In India, agriculture practised on the fringes of a city gets noticed when it is affected by the urban sprawl. The expansion of the city is often seen as encroaching the fertile soil of surrounding regions. But studies have also shown how agricultural land deters (even though temporarily) unwanted urban expansion. As long as remuneration from cultivation offsets the sale price to estate agents and land speculators, the cultivator does not dispose of land. In cases where ownership of land does change, the new owners tend to hold on to agriculture because of the benefits that accrue due to non-taxation of income from agriculture. But since these sites are on the outskirts of cities and far from the usual agro-infrastructure, their economic and environmental effects and links to other sectors are never analysed. Recently there has been a lot of discussions on urban encroachment on good quality agriculture land. According to eminent agriculture scientist M S Swaminathan, conservation of prime farm land for agriculture, soil health and rainwater harvesting are areas that require attention for attaining food security. The need to conserve fertile and finite soil resources has also become a major issue in the political war over special economic zone (SEZs) in the past two or three years. 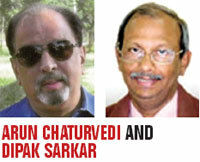 There are some who who believe SEZs are a response to market-driven demand for land. They hold the SEZs essential for the economic improvement of the people living in abject poverty. Then there are agricultural scientists and environmentalists who demand legislation to prevent loss of prime agriculture land along the lines of laws that prevent diversion of forestland. The problem is that while forest is in the concurrent list, land is a state subject and states do not seem to support such legislation. Most people fail to realise that urban encroachment on good agriculture land is a reality we have to live with. It is also true, as pointed out in various studies, that urban expansion is more towards good land, because historically urbanisation started in areas with good agriculture production. The earlier growth of towns was linked to the feasibility of surplus food production in surrounding regions, necessary to sustain town dwellers involved in non-agricultural occupations. The towns were the service centres for their hinterland and balanced rural-urban relationship was necessarily maintained for their survival. But gradually the “happy” living conditions of towns pulled the working population of the hinterland and the increasing numbers swelled the city size in all directions. This trend has intensified. It would also be futile to expect government to bring out legislation for a blanket ban on conversion of good agriculture land for urban land use. Already rigid forest laws have become a bone of contention between the forest and mining/infrastructure lobbies. And then there is the question of what defines a prime agriculture land. In the case of SEZ, the government has been considering treating any irrigated area with double or triple cropping as prime agriculture land. But this way of thinking has been challenged: there are scientists who believe any area with very good quality soil should be off limits even if the area in question might not be currently irrigated. These scientists believe introduction of irrigation can increase the productivity of these areas. Today there is very little scope to feed the increasing population by increasing the area under the plough. The net sown area in India has almost plateaued at 140 million hectares in the past three decades. It is also an established fact that more marginal land is being brought under cultivation in forest fringes. The problem is getting worse as cities plan new developments through formal Metropolitan Regional Boards or such other agencies covering large areas. The Nagpur Metropolitan Plan, currently being prepared, covers almost half the geographical area of the district around a distance of 30-40 km from the present city master plan area. More than 50 per cent of the area in question has fertile soil. If the plan takes shape, a large part of the area under Nagpur Mandarin (the famous Nagpur orange) shall be devoured by urban amenities. Therefore, the solution to prevent conversion of good land has to be market-driven and with a scientific rationale. Can agriculture be used as a deterrent to urban encroachment on good agriculture land? It can, if agriculture is economically viable to offset the market value of urban utilisation. This can be achieved if agriculture is officially recognised as one of the urban functions and included in city master plans. Agriculture as an unorganised activity is carried out in urban areas of India as evident in vegetable production in drains and waterbeds of rivers and in the presence of unauthorised dairies. In developed countries, agriculture is gradually being accepted as an important function to grow healthy food and save transport costs. Supportive city policies are being advocated for all dimensions of the local food system and economy. 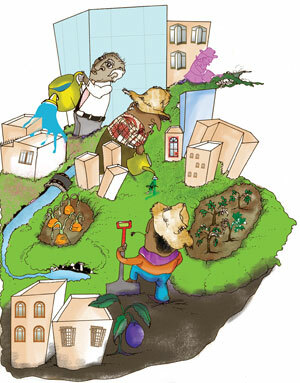 City agencies in the developed countries have accorded importance to framing urban agricultural policies. For instance, the Chicago City Council is currently considering an ordinance that would affect the legal circumstances of urban agriculture in Chicago. In many other US cities policies and practices for urban agriculture that provide as many people as possible with opportunities to grow significant quantities of healthy food in their neighbourhoods, backyards and on vacant lots are being considered. One of the main advantages being cited is to advance ecological sustainability and local economic resilience. Such practices assume even more significance in the age of climate change. Mixed and integrated land use systems envisaged in the US cities call for a new view of zoning and land use approaches—they call for neighbourhood-based food and energy production, nutrient recycling and water conservation. There is, in fact, an official document that mentions urban farming. One of the points in the National Land Use Policy guideline and action points is that urban policy must be restructured so as to ensure that highly productive land is not taken away. Town planning should also provide for green belts. Urban agriculture can be used to implement these guidelines in a holistic manner. The importance and requirement for urban agriculture will only grow in the coming years as transportation costs and distances increase. Perhaps its integration in urban planning, linked through the green belt requirements of the city, can provide the much needed solution to the problem of loss of good quality agriculture land through urban encroachment while providing fresh food and vegetables to the people. y does MoEP give allowance to such plans which make use of agricultural land and are agaist the gram sabha people.There must be a good relatio between governmental and non-governmental organisations so that people of india will be aware of sustainable development.